I acquired these couple of Plum Tree blanks a couple of years ago and cored out as many pieces as I could. There were 7 but I used the smallest piece for the foot on the second bowl photo. They are all sanded to 400grit and finished with Shellawax Glow, except for No.6 which is finished with Wipe-on-Poly. 4 coats. C & C welcome as usual. Pretty cool colors in those. They look great. They sure show great. That is some nice looking wood grain and color. if that’s 400 grit and shellawax Glow I am going to go buy a lathe just to be able to use it …its almost a mirror finish with little effort ! Are you having posting as well, its driving me crazy this side of OZ, thought it was jut my old PC. Plum wood really is beautiful stuff. Hard to come by and can be a bear to work with as it is very hard and brittle. It’s worth the effort though. have used all of my larger pieces up (Mostly pen blank and small spindle stuff left.) and wish I had some more. I need to talk to some of the tree guys around here and see what they can do for me. Great job on the bowls, good use of a coring system. Finish is excellent from the photos. Great looking nest of bowls here Bob, hard to believe that they all came from the same piece of timber lots of color variation, and the finish does them justice. Darn nice lot of bowls Bob, you sure get a great finish on them, the coring has given a variety of grain patterns. Well done mate. robcastle. Sometimes I just shut the PC down and walk away. It drives me crazy. Loading the photos is the biggest problem for me. Now I do that first before I start anything else in the post. That Shellawax gives such a smooth glossy finish, I love it, but have difficulty on larger pieces. But that is probably just me. Yes, you do need to get a lathe. Then the fun begins!!!!!!! 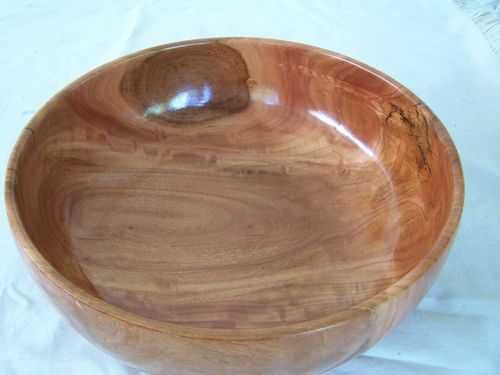 Wow Bob they all look great, the plum tree wood is beautiful….excellent turning and finish.